This type of rice is long and slender. Brown long grain organic rice is one of the most healthy. The grains stay separate and fluffy after cooking, so this is the best choice if you want to serve rice in your restaurant as a side dish, or as a bed for gravies and sauces. 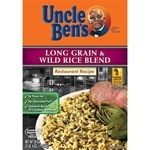 Mars Foodservice Uncle Bens Long Grain Wild Rice 36 oz. 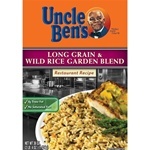 Mars Foodservice Uncle Bens Long Grain Wild Garden Rice 36 oz. 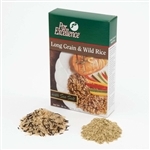 Producers Parexcellence Long Grain and Wild Garden Rice 36 Oz. Producers Extra Fancy 4 Percent Long Grain Rice - 50 Lb. Producers Rice Oriental Long Grain Rice 10 Percent - 50 Lb. 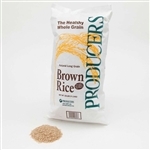 Producers Rice White Long Grain Rice Four Present - 25 Lb. Rice Imported Long Grain Jasmine - 20 Lb. Uncle Bens Original Long Grain White Ready Rice - 8.8 Oz. Uncle Bens Ready Rice Long Grain and Wild - 8.8 Oz.